We had a wonderful time at the Buckhorn Inn last week. As always, the unbeatable combination of your gracious hospitality (you truly care about your guests and go to any reasonable length to please us without fail! ), the comfortable, home-like accommodations (our home away from home), the tasty and imaginative breakfasts and dinners, the swans, the nature trail, and this year the perfect weather making the hiking trails a true pleasure all added up, once again, to the PERFECT VACATION away from the cares of the world, albeit never long enough for our world-weary souls. There has been a week of painting at Buckhorn Inn in the Smoky Mountains every year since the mid 1960’s when famed watercolorist Jim Gray gave classes. Ohio artist Ruth Firestone led a group of artists every year for more than 30 years. We believe, as Picasso once said, that “everyone is an artist.” Young or old, the art of creating is a joyous, exciting process. Amid the beauty of the Smokies, we try to provide the right environment for that process to blossom –relaxing accommodation, delicious food, the congenial company of fellow artists working at all levels. After a hearty breakfast each morning, the day is yours to paint—a rushing river, a quiet woodland glade, asters covering a mountain meadow. In the evenings following dinner, join with fellow artists to discuss and critique the day’s work. On two evenings, local artists will drop in to talk about their approach to painting and discuss their work with you. Whether you’ve just picked up a paintbrush or you regularly show your work in fine galleries, this week devoted to painting can be exhilarating and fulfilling. Rates: The seven-night rate includes accommodation, breakfast and dinner. Artist Contact: If you wish to talk to one of the artists who regularly attends the Painting Retreat, please contact us and we will put you in touch with someone who will share their experience with you. Buckhorn Inn: Nestled in the shade of the Great Smoky Mountains National Park, Buckhorn Inn exudes an ambiance of bygone days. This classic 1938 inn offers grand views of the mountains and the countryside surrounding Gatlinburg that calms the soul and slows the pace to that of another less hurried era. Our 30-acre property is situated less than a mile from the Great Smoky Mountains National Park and just five miles from Gatlinburg. We are convenient to all area activities and attractions, including hiking, arts and crafts, musical theaters, the Pigeon Forge Outlets, Dollywood, the Folk Art Center, and much more. Built in 1938 when this area was just beginning to develop its reputation as an artists’ colony and hideaway for tourists, Buckhorn was considered the best of all getaways to East Tennessee. Let us show you that same care and attention that guests have enjoyed over the last seven decades. Buckhorn Inn is located in the perfect place to enjoy the Smoky Mountains. Whether you are driving, hiking, shopping, or enjoying a show, the Inn provides an ideal retreat for your trip. Beautifully secluded within its own 30 acres to take advantage of mountain views, it is still conveniently located to many area attractions. There is no better place to stay in the Smoky Mountains than the Buckhorn Inn, your access to the national park with its beauty spots like Cades Cove shown above. 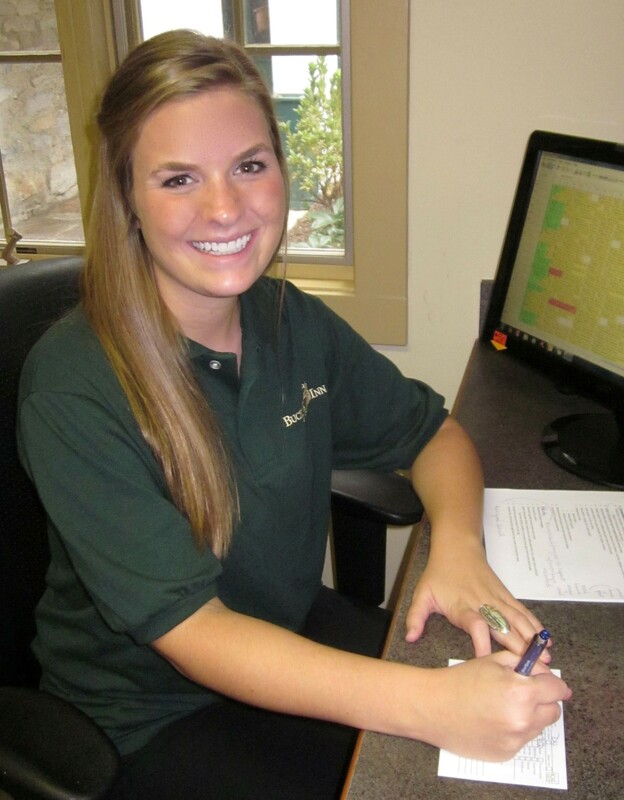 Hi, my name is Taylor, and I am the intern at Buckhorn Inn for the next few months. I am a senior at Carson-Newman College, which is not very far from my hometown, Knoxville, Tennessee. My family has always loved the mountains. From the time I was little, we have spent most of our free time hiking, biking, swimming, shopping, or just exploring the Great Smoky Mountains. 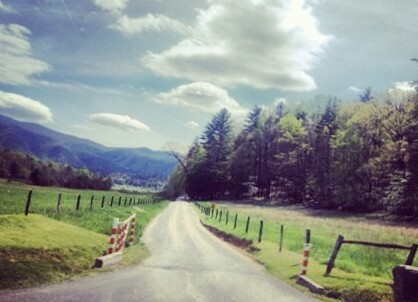 My favorite place in the park is Cades Cove. No matter how many times I have been around that 11-mile loop, I always find something new to fall in love with. My adoration for this beautiful place created the perfect opportunity for me to learn at the Buckhorn Inn. My major is Consumer Services, and I have a minor in Business Administration. Being part of a bed and breakfast operation has been a dream of mine for many years, and there is no place more stunning than Buckhorn Inn. With the support of my professors and the wonderful Innkeepers, Lee and John, I know I will have an unforgettable experience growing to be a young professional. I will be spending some time in each department throughout the inn as well as assisting in planning some special events. I look forward to meeting each guest I will encounter, and I hope I can make their experience at the inn as wonderful as mine has been thus far.